Our Resin Manufacturer of the Month is Ms. Simona Macelaru of FanKit Models which makes kits including tanks, military support trucks, emergency vehicles, construction equipment and civilian lorries. Unlike most kit makers, FanKit Models also offers a building service. To see their wonderful selection, please visit their site at: www.fankitmodels.com. We atIRMA©SM®TM are especially grateful to Simona for agreeing to cast the Coanda 1910 in 1/72. As many of you know, we have been asking several kit makers to do this highly requested kit. Fortunately FanKit Models is located in Romania and has access to the museum where the 1/1 scale model is on display. So we finally have a kit for all of our Henri Coanda fans! Thank you, Simona, from all of us at IRMA©SM®TM! You are appreciated! Simona has kindly agreed to an interview with IRMA©SM®TMto find out more about FanKitModels and her interest in casting resin models. IRMA©SM®TM: What attracted you to start casting resin kits? At the beginning, it was more curiosity and desire to prove my abilities, but in time, everything turned into passion and business. I spent the first 9 years as an employee of a company in this field, where I represented the production manager, the performer and the prototypes coordinator. After all this period, my cooperation with this company I had been working could not continue any longer. At that moment I decided to try my managerial abilities and at the beginning of 2009 I elaborated FanKit Models. IRMA©SM®TM:When you are considering the next kit, how do you decide what will be a good subject? What must be taken into consideration for a successful model? IRMA©SM®TM:Do you do one project at a time or several in different stages? I like finishing a project I started, because I can fully concentrate upon it obtaining the result I wanted. But there were also some exceptions, when I had to work with two projects at a time, due to some loyal customers’ demand(request). IRMA©SM®TM:What kind of research goes into a kit? Does the design require technical drawings, photographs or other sources? The documentation in order to execute the pattern is a very important and defining step because it can decide if the pattern enters production or not. I say this because a solid documentation is required in order to execute a quality pattern. When I say documentation I refer to all stuff including plans, photos, and sketches. I usually study and pick information from more sources trying this way to avoid certain mistakes (errors) that may appear to a certain source. IRMA©SM®TM:Do you have any recommendations for those hobbyists that are considering their first resin kit or are new to resin model building? For all those who choose to assembly a resin kits for the first time I want to announce that it won’t be easy comparing to plastic kits. The assembly of the resin kit requires certain abilities and dexterity being a little different than a plastic kit, regarding to the execution way, the resin kit which is manually made confers in my opinion a greater value. IRMA©SM®TM:Are there any thoughts or comments you would like to share with IRMA©SM®TM and others? I would like to continue the cooperation I started with Coanda Plane to share ideas and opinions and maybe together we can offer the enthusiast persons new sensational patterns. Thank you for the possibility of offering me this interview. IRMA©SM®TM: Thank you for the interview, Simona! 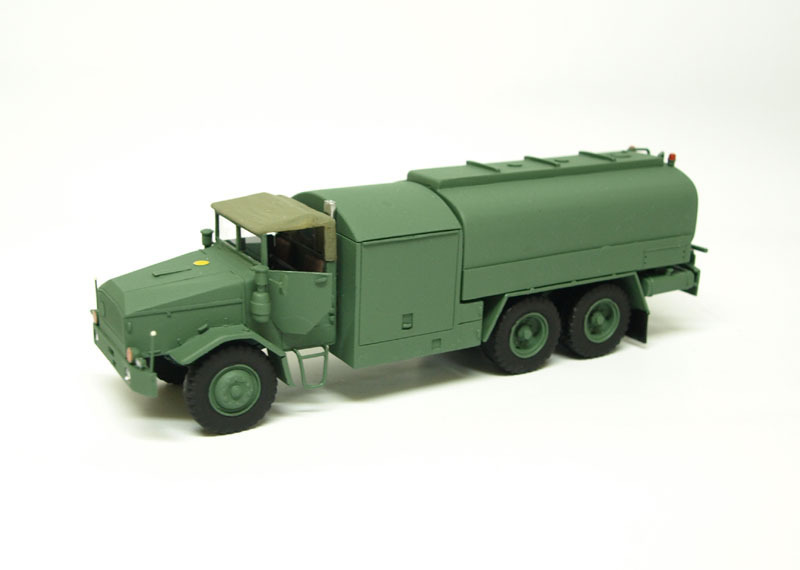 This is the Faun L 908 ATW Fuel Tanker in 1/72. This vehicle served with the post-war German Bundeswehr in the late 1950s. It was built in many varieties including the tanker, shown here, freight, troop transport, and off-road usage. The cabs were in two variations, fixed metal and canvas. 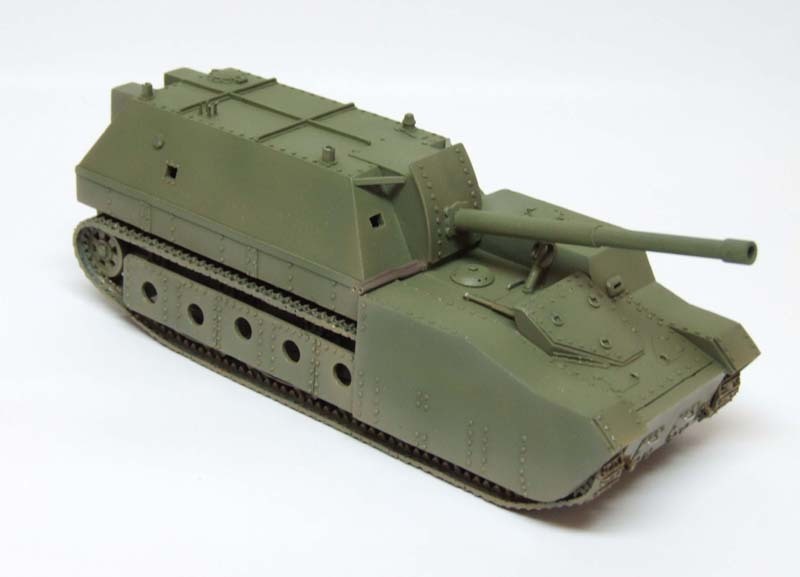 The highly unusual Soviet Su-14 BR-2 heavy self-propelled gun in 1/72. Built as a prototype in 1936, the Su-14 sat on a T-35 chassis and was armed with a 152.4 mm B-10 cannon and weighed 48 tons. It never entered production and bears an eerie resemblence to the German super-tank Maus of 1945. 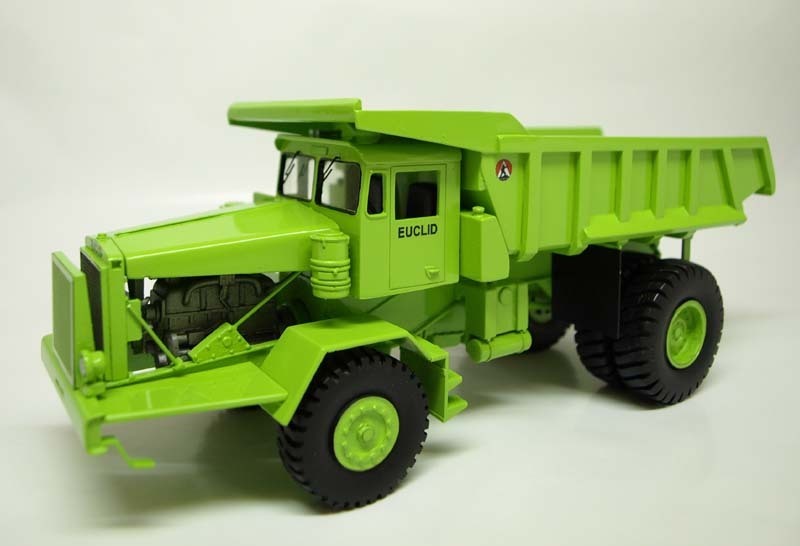 This is the Euclid R-4 (10LD) 4x4-1963 heavy dump truck in 1/50. The Euclid company was founded in 1924 in Euclid, Ohio, U.S.A. as the Euclid Crane & Hoist Company. At first Euclid made road scrapers, then moved into trucks, specializing in heavy vehicles. During the Great Depression the company was reorganized as the Euclid Road Machinery Co. and in 1953 was bought up by General Motors. This led to a global expansion with GM production and export of Euclid vehicles. This hey day lasted into the 1960s with many R-4s being built and used by major construction, mining and government customers. However, in 1968 GM was forced to sell the Euclid division to satisfy an anti-trust lawsuit. This also marked the end of many production lines. The company was then bought by White Motor Company, then sold to Hitachi and is now owned by Volvo. Many of the old R-4s are still in use today. 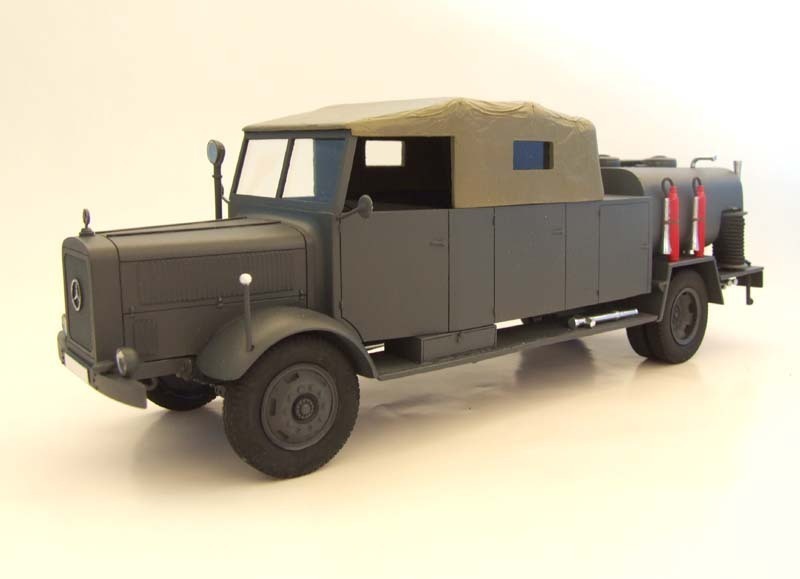 Here is the Mercedes-Benz L4500A TLF 25 in 1/35. Originally a civilan truck, the L4500A is a heavy cargo vehicle still in use by the German Special Armed Garrison Aeronautical Experiments Platoon. If it looks familiar, it is because this truck has been in use during the Second World War by the Former Germany Army. The chassis has been a platform for freight, fuel, emergencies, half-tracks and anti-aircraft.